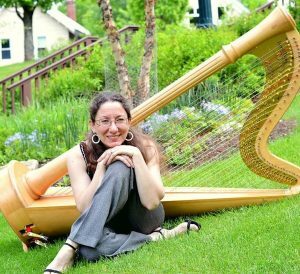 Elizabeth Roth teaches voice and harp for Mountain Top. Elizabeth has had an eclectic career as a musician. She received a BA in vocal performance from Cleveland State University in her home town of Cleveland, Ohio. From there she moved to New York City, where she studied drama at the American Music and Dance Academy, performing in Off-Broadway productions and with several choirs and madrigal groups, most notably at the New York Renaissance Festival in Tuxedo, NY. She studied harp with such notables as Mildred Dilling and Deborah Henson-Conant. Since moving to Maine, Elizabeth has performed in local theaters, including the Maine State Music Theater and Portland Stage. She performed for 25 years with her husband as half of the musical duo “Silk and Steel.” Elizabeth now performs primarily as a solo musician at a range of events, with the motto, “have harp, will travel,” collaborating with other musicians whenever possible. She appears frequently at Mountain Top’s 24 Hours of Music event.